The Seine, rising from Source-Seine, 30 kilometres northwest of Dijon in north-eastern France, is one of the most important waterways within the Paris Basin. It flows 776 kilometres to the English Channel at Le Havre. The city of Paris boasts 37 bridges that span the Seine, including the celebrated Pont Louis-Philippe and the ancient Pont Neuf. Outside Paris, the Pont de Normandie, one of the longest cable-stayed bridges, links Le Havre to Honfleur, known for a picturesque port beloved by the Impressionist painters: Gustave Courbet, Eugène Boudin, Claude Monet and Johan Jongkind. Claude Monet chose the village of Giverny, which is positioned on the right bank of the River Seine where the river Epte meets the Seine, to create his most beautiful masterpiece. The sighting occurred quite by happenstance when Monet looked out a train window on a trip between Vernon and Gasny. It was April 1883, the time of rebirth and transition. It had been four years since the passing of his young wife, Camille who has succumbed to tuberculosis, September 1879 at the age of thirty-two. Grief stricken, Monet turned to his art for consolation. From the vantage point of a train, he knew, at first glance, where he would live and paint for the rest of his life. He created his dreams and gave us the vision of beauty that came from a garden by the River Seine. Today marks Claude Monet’s 153rd birthday. This entry was posted in Claude Monet, Impressionism, River Seine and tagged Claude Monet, Giverny, River Seine. Or if I may, perhaps it is all beyond oneself–the mysterious flow of it all. A very interesting thought. Humanity seeks beauty and tries to define and benchmark this “mysterious flow” as a method by which to control its source and power. Thank you!!! There is something magical about a garden, no matter what season. I am finding the stories behind the artists to be the key to understanding their work. Many (and I include myself here) think arts comes forth with dramatic flair – quick and efficient, like Zeus giving birth to Athena. It seems that there is a lot of angst in the creative cauldron. Thank you for celebrating Monet’s birthday on this site and your Chasing Art. Lovely! I have been there twice in winter and spring and is reallt unforgetable. Your pictures do the honors to the place. Beautiful photos! I would LOVE to visit Giverny one day. Wouldn’t that be nice to meet there one day. 🙂 We actually just bought a small “pied a terre” in France, so I will be visiting France more often in the future. Giverny in the future!! Yes!!!! Oh, we didn’t buy something in Paris. WAY too expensive for us. We bought something in a beautiful little city in the Loire Valley – Angers. Found a link!! (it’s the English version – still need to brush up on my high school French. The tag line is : “Angers Offers The Highest Quality of Life.” Sounds perfect. there have 10 libraries – pure heaven! That’s good to hear. I haven’t actually been there yet. Le Husband has been taking care of arranging the renovation, and then the renovation will take some time. I hope to go early next year. So do I!!! With his love of flowers and colour, it is hard to believe that he was ever despondent. Perhaps it was his ability to understand the extremes of emotion that allowed him to create a new vision of the world. My dear friend, thank you for your gracious comments and reblog. What I learned from my visit to Giverny – if we embrace the necessity to love, we recognize our creative soul…. Thank you, Barbara, for your visit and heartwarming comments. His tenacity was as remarkable as his ability to communicate universal themes through the medium of colour. I love the quote. He was amazing. Just ethereal Rebecca. I want to jump into the photos! Thank you so much for adding to the discussion – very much appreciated, my dear friend! You’re far too kind!! Hugs and enjoy your weekend! Thank you for the wonderful tribute to Claude Monet and to the fallen soldiers of France. This is particularly moving for me, given the recent November 11th Remembrance Day. Thank you!!! What a wonderful place to work! To wake up every morning to go to a place of art, beauty, knowledge – what joy. I just went on National Gallery and found this gem, which is one of my favourites: Woman with a Parasol – Madame Monet and her Son 1875. Happy birthday, Claude. What stupendous gardens you have painted. Love the photographs here. Most striking. I agree – a lovely dream. It seems that we are drawn to water – perhaps it is that we intuitively know that water is essential to survival. Beautiful photographs! So green and lush. Thank you!!! The photos were taken in May, the time when the green is moving from light to dark green. It was a cloudy day with momentary sunshine, which also added vibrancy to the colours. I’m running a bit late in responding to some of these wonderful blogs such as yours, but publication a book takes more time than one would like. Thank you, JJ, for your comments – you always give me a lift for my day. I am delighted to hear that you have completed the publication of your book. How exciting – I am celebrating. I was overwhelmed by Giverny. I came in May, but would love to see the garden in all seasons. I want to return…. Have you noticed that every story has a river? In retrospect, though until you brought it to my attention it hadn’t come to mind. But you are right, every story, one way or another, does have a river, and who but our astute Rebecca is there to remind us. That’s a place I’ve been intending to visit for a while. Next summer I’m going to make the effort after reading this. Thank you. I’m so excited for you!!! It gives perspective on the creative talent that is within each of us. I love the spirit of the garden. It always refresh my mind. So are those photos that look so beautiful. Thank you. Thank you so much for your visit!! You made my day. I agree – there is a gentle and compassionate spirit within this garden. The life within the life of a garden or river or forest is magnificent. It speaks languages that only the heart of love and peace and oneness can hear. Monet always had a sense of conveying that love in his art. I visited Giverny some years back, and it really made a lasting impression. I like the way that Monet gave each room of the house a different theme. Since then, I’ve always wanted to do that. Hopefully, I’ll accomplish it soon. 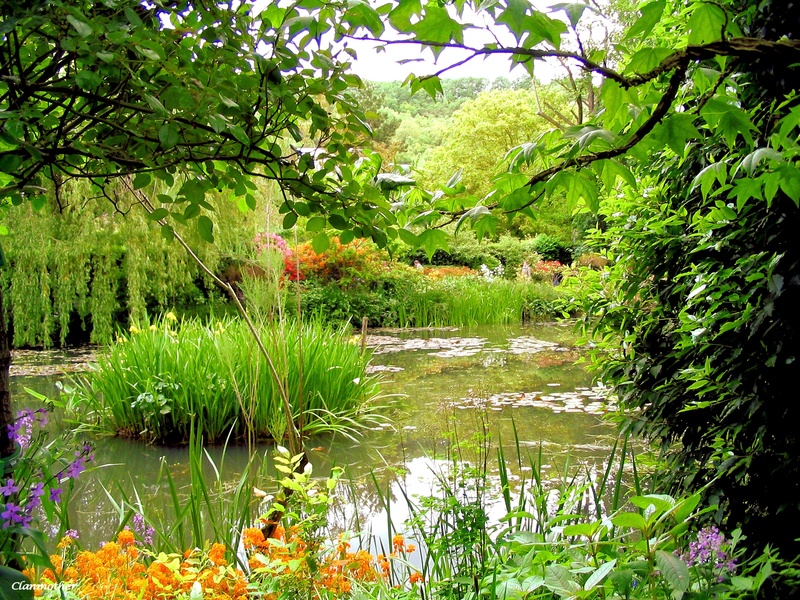 I agree – there is something about Giverny that inspires us to strive for all things artistic! I wish you the very best in your creative endeavours!!! Thank you so much for stopping by!! Your comments are truly appreciated. You made my day, love all the pictures, they are simply beautiful! Monet is one of my favorite painters, and is true you cannot put meaning to art you just love it. So beautiful!! This is one place I must visit. Really lovely. I’m glad you like it!! Isn’t it interesting that works of beauty and love live past the lifetime of the creator. Reminds me of a quote by J.R.R. Tolkien.